Black and white is the ultimate classic look. It's safe, yet strong and honestly you can never go wrong. To spice up your wardrobe, think outside of the box and add a pop of color or a fun print to your basic black and whites. It really is fun to play with the different colors and the different looks that you can create. Take a look at some of these black and white with a pop of color and print outfit examples below. Funky, fun, and chic all in one. Find these fabulous red skinny pants with ankle detail at H&M for $49.94. Pair with these black and white block top from Old Navy for $29.94, Plat from bootie from Charlotte Russe for $35.50, Dudzic Aldo Bag for $48.00, and these amazing striped triangle earrings from Forever 21 for $3.80. Totally chic with a seventies vibe. This cream tunic from H&M for $34.95 is perfect paired with tights, skinny jeans, or bare leg. Pair with these platform suede knee high wedge boots from Charlotte Russe for $40.00, H&M cuff for $9.95, Gold and black fan earrings from Forever 21 for $4.80, and tie it all together with that extra sass with this leopard bag from Forever 21 for $26.80. Hot pink, black, and white.. super chic and fun. Find this adorable skirt at Express for $69.90, this Ponte knit jacket from Target for $19.99, black tank from Old Navy for $9.50, and tie the look all together with this hot pink crossbody multi zip bag from Forever 21 for $26.80, and hot pink feather earrings from Forever 21 for $5.80. The perfect weekend outfit. Find these adorable blue jeans at Old Navy for $34.94. 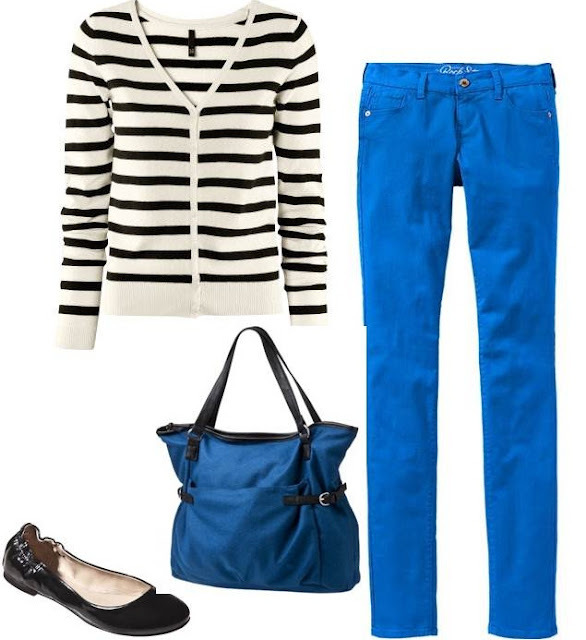 Pair with this black and white striped cardigan from H&M for $17.95, patent leather ballet flats from Target for $14.99, and black and blue matching tote from Target for $ 29.99.